France in 1648 is in upheaval: Cardinal Richelieu has passed away, the Queen is ill, and evil Duc de Lavelle is plotting to usurp the crown by forcing a marriage to Princess Henriette and murder young Prince Louis. The Queen summons the only persons that can help: her trusted Musketeers! 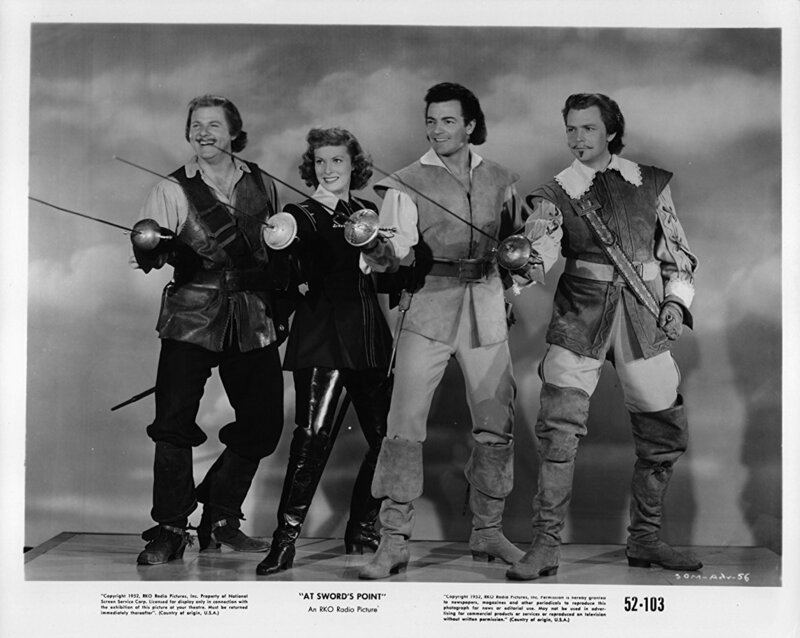 But the quartet have either grown old or died, and in their stead come their equal-to-the-task children, Cornel Wilde (D’Artagnon Jr.), Dan O’Herlihy (Aramis Jr.), Alan Hale Jr (Porthos Jr.), and – Maureen O’Hara , daughter of Athos!! AT SWORD’S PONT isn’t a great movie, but it is a fairly entertaining one, with lots of flashing swordplay, leaping about, cliffhanging perils, and narrow escapes. It kind of plays like a Saturday matinee serial, and there’s a lot of fun to be had, with Cornel Wilde a dashing D’Artagnon Jr, O’Herlihy a competent second fiddle, and Hale doing his usual good-natured lug thing. 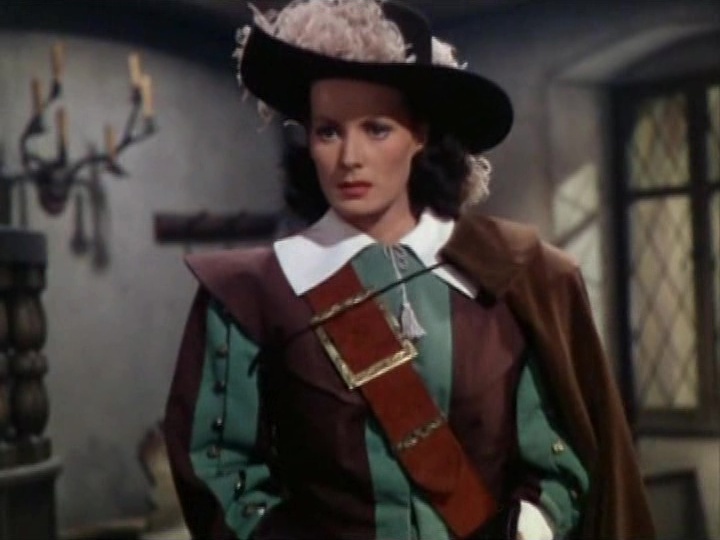 But it’s marvelous Maureen who kept me captivated throughout, her flaming red hair streaming as she battles side by side with the male Musketeers. 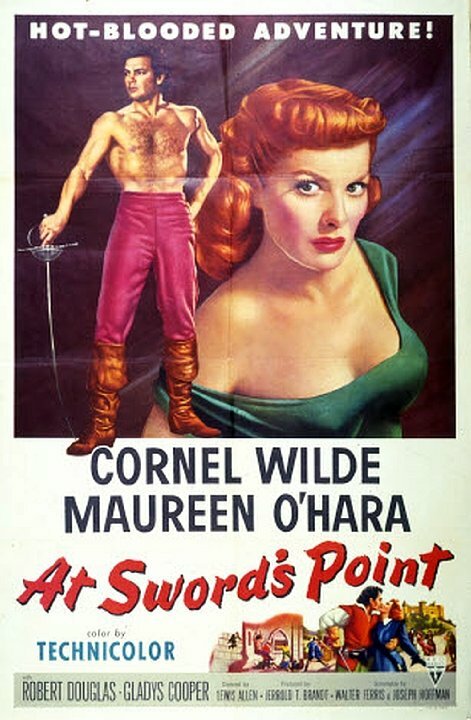 She’s no slouch with that sword either; Maureen could buckle her swash with the best of ’em! The backstory behind the making of AT SWORD’S POINT may actually be more interesting than the movie itself. Republic first announced it would make the film in 1947, based on a screenplay by Aubrey Wisberg and Jack Pollexfen. It ended up being filmed two years later at RKO, then sat on the shelf another two years. When it was finally released, Walter Ferris and Joseph Hoffman got the screenwriting credits, with Wisberg and Pollexfen credited for the story only. By this point I’m sure they didn’t care, having moved on to form their own Mid Century Productions, making low budget flicks from 1951’s MAN FROM PLANET X to 1961’s SECRET OF MONTE CRISTO. Why the movie sat so long is unclear; no doubt notoriously meddling RKO boss Howard Hughes had something to do with that! 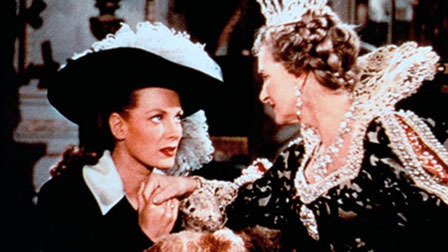 The supporting cast offers fine performances from Gladys Cooper as Queen Anne and Blanche Yurka as tavern keeper and Musketeer aide Madame Michom. Robert Douglas makes a hissable villain, Nancy Gates a regal Princess, and Familiar Faces Tanis Chandler, Tris Coffin, Holmes Herbert, Lucien Litlefield, and Phil Van Zandt pop up as well. Director Lewis Allen has some good films on his resume (THE UNINVITED, SO EVIL MY LOVE, CHICAGO DEADLINE, SUDDENLY ), and keeps the action running along swiftly. Roy Webb’s jaunty main theme sounded suspiciously familiar to me – compare it to John Williams’ theme from 1978’s SUPERMAN and judge for yourselves! AT SWORD’S POINT is an ‘A’ film in intent, but ‘B’ in execution. It’s hardly a classic of the swashbuckler genre, but it has it’s moments and can certainly be enjoyed on a mindless level. The bold Technicolor helps give it a big budget sheen, Maureen is both lovely and dangerous, Wilde is a heroic D’Artagnon, and it’s all harmless fun. It’s light and breezy and if you’ve got an hour and a half to spare, by all means give it a shot. This really is a twist on the usual Musketeers’ story. Sounds like a lot of fun, especially with this cast. I loved Maureen in this one! And the rest of the cast is good, too. Yep, definitely a fun film!